O, I don’t think I’ve been prominent at all. I voted Remain. I didn’t make a big thing about it. I was writing an article about how we have a Christian duty to participate in politics and, for the point of transparency, declared my own interest. But I’ve said many times since that we’ve voted, that’s the decision we’ve taken, and now we must make it work for the common good, in the national interest, and so that Britain has a deep sense of commitment round the world; is a global force for good. 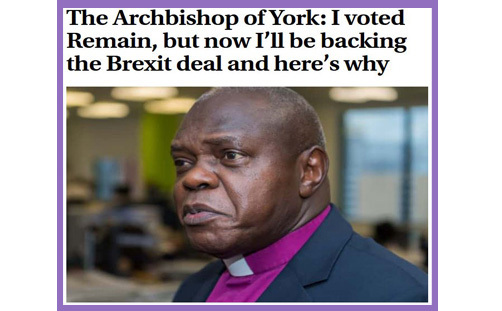 And right on cue, writing in the Yorkshire Post, the Archbishop of York tells all those who voted to leave the European Union that their desires are “childish”, and that “no serious politician should have entertained it”. How’s that for moderation and restraint? How’s that for a thoughtful, considered and gracious contribution to the sacred mission of national reconciliation? Dr Sentamu insists that the Prime Minister’s ‘Withdrawal Agreement’ is the only way of bringing order to chaos. There is an argument to be made for that, and there are some intelligent and discerning voices making the case. But not one (as yet) has answered the constitutional unacceptability (to put it mildly) of this Parliament binding its successors with an irrepealable ‘Backstop’. Not one has addressed the irreconcilable tension that a referendum designed to ‘Take back control’ actually, with this transitional deal, hands all the control to the European Union. At least as EU members we were always in control by dint of being able, as a sovereign Parliament, to repeal the European Communities Act 1972. All it ever needed was a parliamentary majority to enact it, and that would have been it. Theresa May’s deal nullifies sovereignty insofar as it renders this Parliament and all future parliaments subject to foreign political power and to foreign courts. With no unilateral right to withdraw from the Backstop (and nothing, bar a whole lot of blind faith in the EU’s goodwill and sense of fair play), it is hard to see how we might not end up in everlasting Brexit purgatory. Dr Sentamu is perfectly free to make his case for the Prime Minister’s transition deal, and to believe sincerely that it is the wisest and most beneficial course of action – or ‘compromise’ – for national unity and the common good. But quite why he should feel the need to insult the intelligence and maturity of those who have qualms about the constitutional position, or who might prefer a ‘hard’ or ‘real’ or ‘pure’ Brexit for other reasons, is a mystery. After all, some of them fill the pews in his churches every Sunday, and might not take too kindly to being patronised and held in such contempt. And for those who don’t attend church, Dr Sentamu is informing potentially 17.4 million people that their desire for the United Kingdom to become a sovereign, democratic, self-governing nation is “childish”. His intervention coincides with Matthew D’Ancona writing in the Guardian, who tells us that Brexit is driven by bigotry. Ergo, ‘hard’ or ‘pure’ Brexiteers are the worst kind of bigot. Fusing the two schools of thought, we arrive at Brexiteers basically being ‘childish bigots’. If Brexit is driven by bigotry, then bigotry drove the Diggers and Levellers. If Brexit is driven by bigotry, then bigotry drove the Protestant Reformers. If Brexit is driven by bigotry, then bigotry drove the Roundheads and Whigs; the Methodists and Chartists. One man’s bigotry is another man’s quest for liberty. And one man’s childishness is another man’s childlikeness, which is the essence of the faithful Christian life. Those who dream of dwelling in liberty and security, beneath a sovereign canopy of democracy and transparency, are not childish, but virtuous, unpretentious, open, humble and honest. But patronise and insult us, if you wish. It simply means you have not a single political (or theological) argument left.